An internal battle between members of the Occupy SLO movement has lead to the filing of a theft report against four members who cleaned out the San Luis Obispo County Courthouse demonstration site. 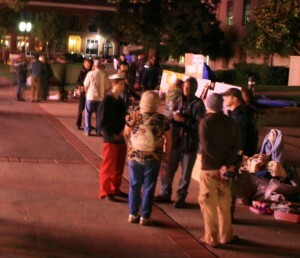 Several Occupy SLO members opposed to the courthouse demonstration moved in on the site Wednesday night taking tents, clothing, posters and furniture while the site was largely unmanned. In response, several supporters of the demonstration filed a report Thursday morning with the San Luis Obispo Police department claiming Occupy SLO founder Pete Evans and three others stole their belongings. Evans said that except for a couple of “vagrants,” the camp was largely unmanned when they took it down. “It is a transient meth camp,” Evans said. “We think they are damaging our relations with the community. Supporters of the demonstration argue they are not all transients and that Evans does not have the legal right to take their belongings. Steven Boothe, a Cuesta College employee and demonstrator, said they took a canopy tent he has owned for years. Evans said two officers showed up at his house earlier today. He said he told the officers he was making sure the items were kept safe. He questioned how anyone could prove who owned each item because no one had their names on their things. Evans returned most of the items on Thursday afternoon. Rifts in the Occupy SLO group started more than a month ago when several loud protestors showed up at a Mitchell Park meeting that Evans and the group’s founders organized. The new members interrupted the meeting to argue over the direction the movement should take. At first, both camps were in favor of the courthouse occupation. But as more and more homeless arrived, several of the Occupy SLO founders wanted to disband the occupation. After about 18 days, the occupation opponents made their first attempt to disband the camp. They removed protestors’ belongings and left notes telling them where they had taken the items. However, this time, there were no notices left explaining who had taken down the protest site. And this time, Evans helped reconstruct the protest site. Boothe said that even though some items are still missing, he wants to have the charges dropped. However, other members of the group still want those who took their things arrested. One useful thing OWS has done here is, it lured out or flushed out the trash that has migrated and hidden here in the creek areas. Being able to recognize the trouble makers will insulate the real (what i call or label) OWS movement-a free expression and civilized forum. The theft stated in this article resulted in a decision reached by consensus by the General Assembly on Saturday, November 26th to publicly disassociate Pete Evans, Desire Gallo and 3 other people from the movement. To focus more on strengthening the principles of the movement, supporters and members of the organization believe that this public disowning will help the group move in a more positive direction. The illusion of their involvement has compromised the principles that the movement is working with, causing the divide which contradicts unity and solidarity. Occupy San Luis Obispo and Occupy Wall street has no official spokesmen, founders or co-founders. The General Assembly is comprised of those who choose to be a part of contructive dialogue and activity. Anyone who is claiming to have any singular authority to make decisions on Occupy SLO’s behalf, is speaking as an individual only and not in any official regard. For official information and activities, please come to the General Assembly every Saturday at 1:30, or consult this website. Who is this person to think they can speak for the group? The last thing they need is another spokesperson who thinks they speak for the group. Now that Pete is gone, I see The Truth is trying to take over. Will this never end? Some comments have been deleted , mostly noise, some smells and some misplaced sentiment, in any case if you have a question or problem with moderation please Email. Whatever possessed the organizers of Occupy SLO to think they could control a protest/movement that everywhere else is turning into violent clashes, either started by the protesters or by the police with their response? Did they truly believe that once the protest turned into a true “occupation” of the courthouse grounds, everything would be just hunky-dory? Despite no bathrooms, and no place to wash up? Did they believe that no homeless or riff-raff would come in and possibly disrupt the event? Don’t they know that scofflaws hitch onto people practicing civil disobedience? There’s nothing like a crowd to hide in when you’re up to no good. Those people should thank Pete Evans for taking their stuff. Had the police taken it, it would have gone straight into a dumpster and then off to the landfill. At least they have a chance to get it back. At this point, while I truly love a good protest, Occupy SLO is done for and the movement across the country will soon die out too. But it was a good fight while it lasted. Now get your butts out there and protest with your vote, that’s the only thing that the politicians have to listen to. There is no question about the materials the handlers abandoned at the site last week, it is all back in their hands. Since then the site has been hosting sleepers, sometimes abandoned and sometimes a few forlorn folks hanging out. The movement is important and ought to continue, with some new people who have more direction than those in control now. It may have no leader but it has no leadership, no direction, no progress. The only unifying effort right now is the bitter vendetta agains those who foresaw this disaster and spoke up against it, and unlike so many-they acted. For that they are being relentlessly harassed by a gang of miscreants. Wow, you might have seen a forlorn look, 900 police arrested 300 demonstrators at occupyla this morning, about 1:30 am. They also raided Phillie. We are in solidarity with these brothers and sisters. We have relationships with these other occupations and people traveling through from one camp to another are stopping in, giving us talks and workshops. Its been awesome, however when one of our compadres gets their head busted in, we take a moment to reflect on that. Today, I am grateful that I can think for myself, and I know right from wrong. We had a very exhilarating Logistics meeting last night. Today we acted on our plan. It was fruitful. Our direction is clear and our motives are becoming purer. The fray is OVER so put it to bed, unless you’re being paid to say bad things about occupyslo. Ocuppyslo started on October 11, 2011 with a simple street protest, no one knew anyone else. No one knew how to do anything and here we are, a short 7 weeks later, fending off people who ‘think’ we should be doing MORE. It took George W. Bush a year to take action over 9/1,1 8 years to wreck our economy, and a few years for Obama to sell out and our troops haven’t come home yet. The republicans have another set of clowns lining up and Obamba? Man, I don’t know. I won’t even look at Ron ‘Racist’ Paul. This is the first time in my life I haven’t wanted to vote. Today, figures put out by the Guardian show that, 0.01% of the richest people in the USA own 30% of the USA. Gee, I look a little forlorn, some days, but today I have a way to work on the problems this great country has. I’m fully awake and not fearful of what is down the road for us. Did any of you think this was going to be easy? Did some of you really think that we would have an answer 7 weeks into this? I was taught to place my principles over my personality and the personality of others, because, if I believe in nothing, I fall for everything. Control and who has it, isn’t the answer. We’ve been bought out and we found out the price wasn’t high enough. Hear my new chant, “the banks foreclosed, we got hosed… the banks foreclosed, we got hosed… the banks foreclosed, we got hosed… ” Don’t hate the messenger, hate the message. Oh, this is one reason I occupyslo. “The occupy movement was doomed for failure right from the start.” As of this writing there are 118 posts demonstrating there is very little agreement among the members of the occupy movement. In fact there is strong disagreement to the point where people are calling each other liars, thiefs, drug infested, dirty, smelly and just about every other derogatory word possible. Without leadership willing to vet out those camping out and causing the trouble, I again say the occupy movement will fail. And that is why I still occupyslo. For every idle mind with out imagination or spirit who says we will fail, there is one person at the occupyslo camp who gives me hope of change for our great country. For all the name calling there will be someone at occupyslo who will greet me with a hug in solidarity with the rest of the movement. If you look at the record there is really only one person slinging personal insults (degenerate, smelly, meth heads). How is it that the 1% can buy votes, foreclose on homes, create a false economy, not pay just taxes, live in ostentatious wealth why people die, in the USA, everyday due to lack of nutrition, medication and housing. Simple needs like a job that can support a family, a baby getting formula or healthy breast milk, children having clothes to go to school in, and a place for our 1st Amendment Rights to be heard, without fear, are not yet met. I don’t take that lightly. My Dad was WWII Marine Vet at Iwo Jima. My Father-In-Law spent his youth in a Japanese Internment Camp, and he was born in California! He later served in the most highly decorated outfit in the US Army in Berlin, came home and waited, in camp, for his turn to go home. Our family has paid our dues and we have always fought for what is right. So why is it we, who occupyslo, are undirected, argumentative, smelly and poop on the lawn again? Man, put me in jail for taking a poop but lets spend an obscene amount of money on an election that just perpetrates the myth that the USA is the land of the free. We are still the home of the brave but we are not free. I’m going to continue to occupyslo until the bullies in corporate amerika and Washington and inside our SLO courthouse stop, look and listen. Some of us might have given up, quit, resorted to bad behavior, but its not over and I’m not going home. I haven’t been fully heard yet. What you believe in is good I think. Wall street is the problem. They own the president, they own both parties. I too want to put a stop to this. The occupy movement could have been something. But the way it is being run, it only attracts the worst elements, many of which are just downright evil people. And the rest of us want nothing to do with these elements. How can you attract a majority when your core are those we cross the street to avoid? Yawn, I hear you talk a lot about being a founding father of the OSLO but you seem to only hate the baby you say you created. Bad parenting Pete. Does anyone else find it ironic that a group that embraces socialism ( theft by govt ) would complain about theft by individuals? About as ironic as a “large unmanned demonstration” – hehe. Occupy San Luis Obispo and Occupy Wall street has no official spokesmen, founders or co-founders. The General Assembly is comprised of those who choose to be a part of constructive dialogue and activity. … and what do you embrace? not ironic at all. That’s politics. Any rationalization possible to get what you want. “as in this morning when the site was, yet again, totally abandoned; as it was early last Wednesday night.” THEN WHO TOOK THE PICTURES WHEN ALL OF OCCUPY’s THINGS WALKED OFF? I understand that the only reason the people were not stopped was that one had previously assaulted a young lady while she was protesting. I’m fairly sure this will go down like attempted rapes at Apple Farm earlier this year. The perpetrators were caught on film and identified but no charges were brought. How can these things be allowed and condoned in San Luis Obispo? Let me clarify the malfeasance was not by the protesters it was by those that are opposed to them. There is so much (too too much) crap here, I doubt if anyone is going to read into much. What I have read so far, if it is any representation of OWS movement, it ani’t going NOWHERE or ANYWHERE! The only impact I see from all of this is an invitation to anyone or someone who will run for office advertising-promising general change that he or she may likely be unable to keep because of the hugh political-legal infastructured web already woven by the rich and powerful. The good OWS people are better off spending their time on something or anything that will give them enhance themselves, or even a hobby or passion like cooking, reading or writing.